Learn about the differences between low and high efficiency water heaters. Compact and efficient: A tankless water heater can be mounted just about anywhere - even in the attic, as shown in the photo. A tankless water heater, also called an on-demand water heater, only begins to heat water when a demand is made by opening a hot water tap, turning on a dishwasher, or operating a washing machine. Triple H Home Efficiency Experts offers free tankless water heater quotes throughout New York. Contact us today to schedule your appointment! 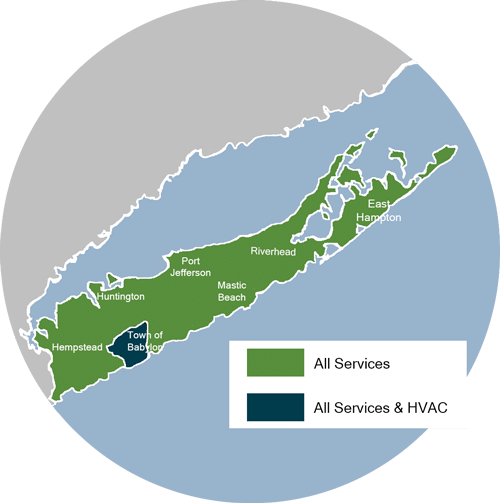 We service Brookhaven, Islip, Huntington, and the surrounding areas in and around Smithtown, Huntington Station, Bay Shore, Brentwood, West Babylon, Ronkonkoma, Central Islip! No hot water tank is required (thus the "tankless" designation) because the water is heated on the way to its destination. The flow of water triggers gas burners or an electric heating element inside the heating unit. When the tap is closed, the heat goes off and energy consumption stops. Because a tankless water heater eliminates standby heat loss, you're not paying to continually reheat water in a tank. This makes any tankless water heater inherently more efficient than any tank-type water heater. Tankless water heaters are used extensively in Europe, where energy costs are much higher than they are here. Case studies have demonstrated that replacing an old tank-type water heater with a tankless model can cut water heating expenses by as much as 45%. Tankless heaters fueled by natural gas and propane are more efficient than electric models. Energy efficiency isn't the only benefit you enjoy with a tankless water heater. While a tank-type water heater can actually run out of hot water, a tankless model can provide an endless supply, as long as there aren't too many users at one time. Illustration of a gas tankless water heater, with copper heat exchange system. Tankless water heaters are very compact. A house-size model is about the size of a suitcase, and can be mounted on the wall. Gas-fired models must be vented to the outdoors, but many of these utilize direct-vent technology, which means that no chimney is required. Instead, exhaust gas is vented outside through a PVC pipe that extends through an exterior wall. Tankless water heaters are so good at transferring the heat from the burning fuel to the water that the exhaust gas is cool. That's how it can use a plastic pipe to release the exhaust out of the side wall of your house. If you are interested in saving money on water heating by installing a tankless water heater, talk with Triple H Home Efficiency Experts about a free water heater upgrade quote! Energy efficiency: A tankless model cuts water heating expenses by as much as 45%. Endless hot water: This system maintains the flow of hot water as long as the tap is open. Compact size: A tankless model's small size provides many installation options for your home. Long-lasting: Tankless water heaters typically last longer than tank-type water heaters. No standby heat loss: There isn't any standby heat loss from a tank of hot water sitting all the time. On demand: When you're sleeping, at work, or on vacation: it's completely off. It's only on when you need it to be on. Cost: Tankless models are more expensive than most tank-type water heaters. Well water transfer: If you have well water with lots of minerals in it, a tankless water heater is not the best choice. Call 1-866-977-6917 or contact us online to schedule a free water heater estimate! We also offer a comprehensive home energy audit to discover all of the services that might benefit your home, including water heaters and many other energy-efficient products. Our services our available throughout the Nassau & Suffolk Counties area including Brookhaven, Islip, Huntington.